Simone Bader and Jo Schmeiser have been working together as Klub Zwei since 1992. Situated between art, film, and new media, their works deal critically with migration, racism, anti-Semitism, and the way these are portrayed in the media and in the public domain. 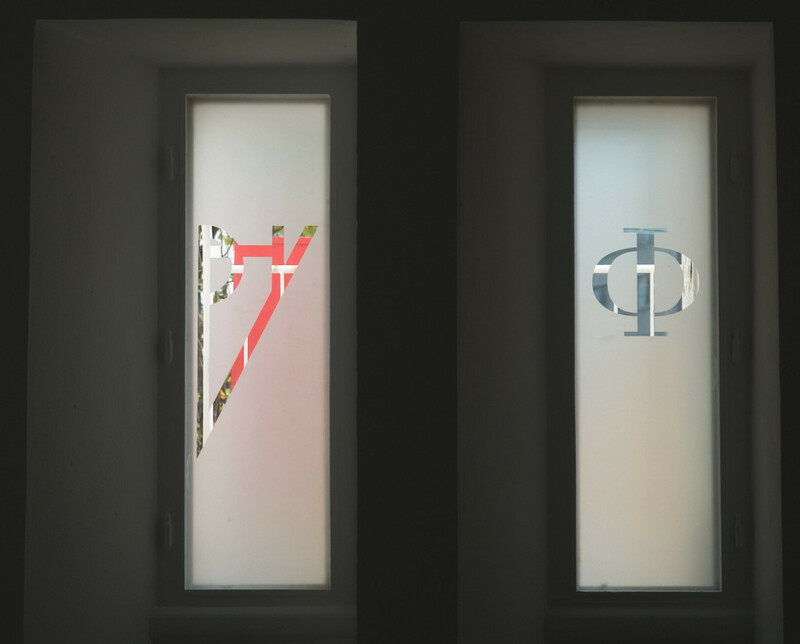 Klub Zwei analyzes representational order because structural changes always have to do with visibility and making visible. At the same time, Klub Zwei reflects its own conditions of production and develops egalitarian models for cooperation that eschew the pattern of authoritarian authorship. 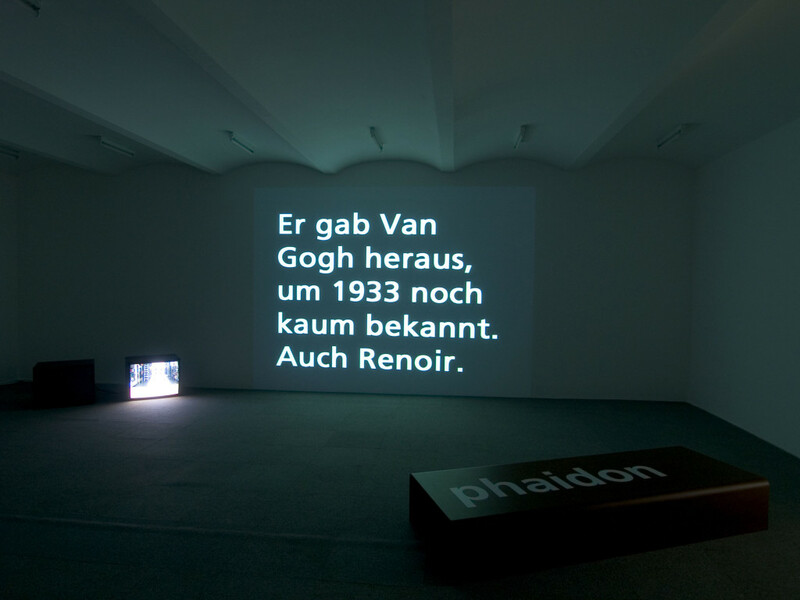 For the exhibition at Secession, Klub Zwei has developed three video installations that follow from its most recent film and book project Things. Places. Years., examining the impact of the Shoah on subsequent generations and the ongoing presence of loss. The installation Phaidon. Verlage im Exil / Phaidon. Presses in Exile focuses on the history of the Phaidon Press, which was originally based in Vienna. Founded in 1923 by Béla Horovitz, Ludwig Goldscheider, and Fritz Ungar, from 1933 it specialized in titles on art and art history. Phaidon’s success was based on its courage in publishing high quality books with large print runs at prices affordable by a broad readership. In the 1930s, Horovitz stepped up international partnerships with British and American publishing houses. On this basis, when Austria became part of the Nazi “Third Reich” in 1938, he was able to sell Phaidon pro forma to the British publisher George Allen & Unwin, thus avoiding expropriation as part of the Nazis’ campaign of “Aryanization.” Before long, Horovitz and his family emigrated to England. In this way, he not only escaped from the Nazis, but was also able to continue his publishing activities and to sell books in Nazi Austria and Germany. 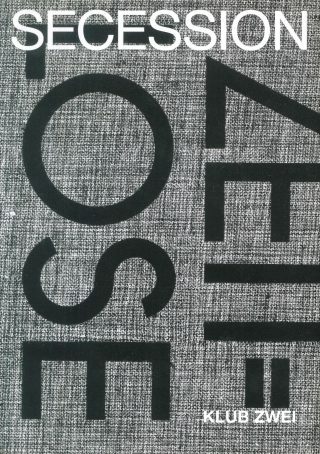 This story is exemplified by Ludwig Goldscheider’s book Zeitlose Kunst, published in 1934 in Vienna and three years later in London under the title Art without Epoch. The works chosen to represent Modernism, the graphic design, and the typography reveal the publishing house’s internationally-oriented self-image. The Grotesk typeface used for the title and the text was developed in the early nineteenth century and taken in the twentieth century by Bauhaus designers as the basis for their new typeface, Futura. Even before Austrofascism and the “anschluss,” this signaled clear opposition to the Gothic script and attendant ideology propagated by the country’s German nationalists. 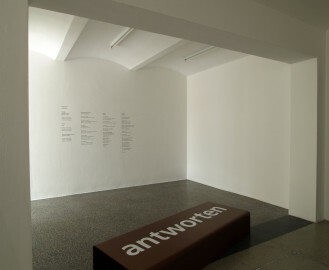 The installation combines interviews (with Béla Horovitz’s daughter, art publisher Elly Miller, and granddaughter, writer and editor Tamar Wang, and with Ursula Seeber, director of the Library of Exile at the Literaturhaus in Vienna) with typefaces, typographically designed translations, and additional comments, all of which find a juxtaposition in the space. 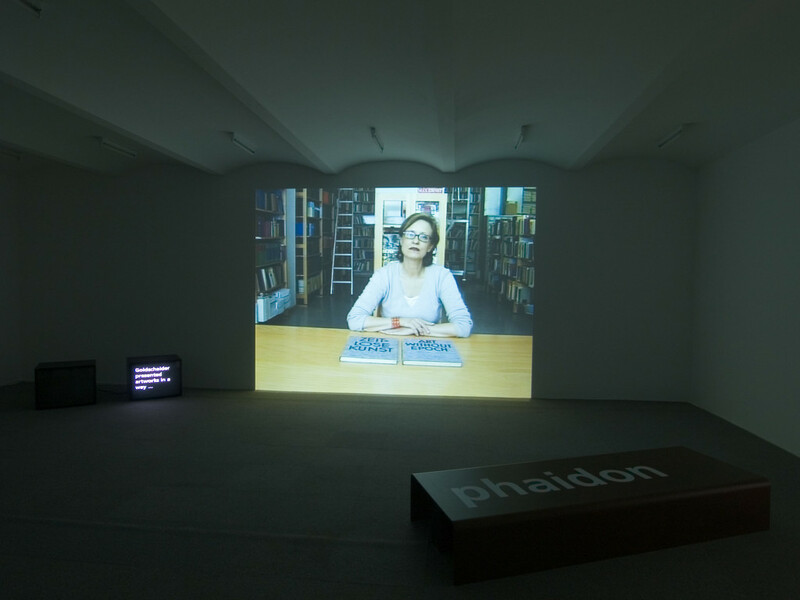 As well as drawing attention to Phaidon’s cosmopolitan and aesthetic standards, Klub Zwei also highlights a consequence of emigration: the loss of language coupled with the continuing existence of the cultural context. The interviewees in the two other linked installations Verlust / Loss and Antworten geben können / Response Ability are Katherine Klinger and Ruth Sands, both of whom work at the Institute of Contemporary History & Wiener Library in London, and Hannah Fröhlich, who works for the Jewish Community in Vienna. 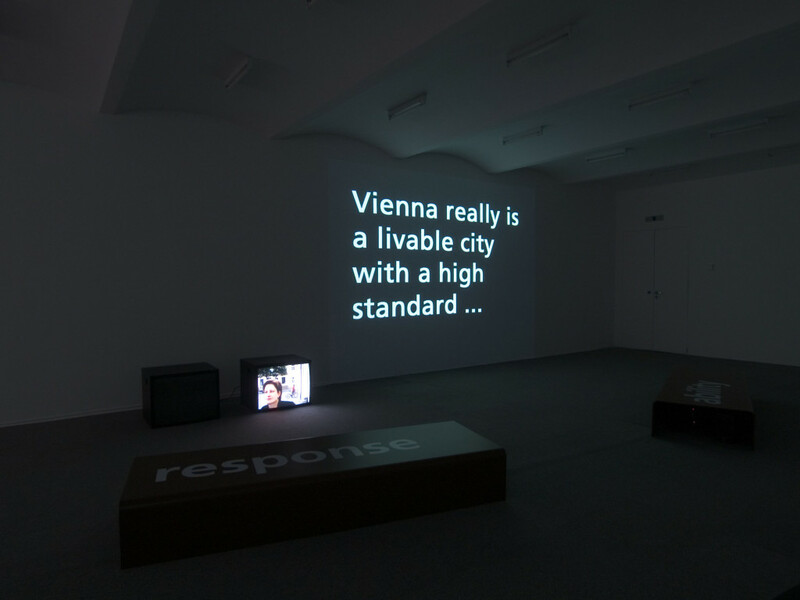 These interviews, which were conducted in Vienna, took as their point of departure perceptions of the city as shaped by the history of National Socialism and the Shoah. The interviewees focus on the ways expulsion and extermination have become irrevocably inscribed in the city of Vienna. 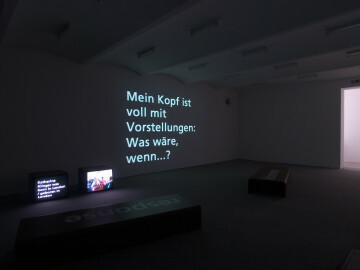 Among others, the project raises questions about the different positions that are (necessarily) adopted by subsequent generations (descendents of the victims and of the perpetrators), about the knowledge passed on to them by parents and grandparents, about how they deal with this knowledge, and about how it influences their lives, attitudes, and actions in the present. Klub Zwei live and work in Vienna.